It seems like Motorola are finally prepping a high-end imaging device. Yes, you read it right. 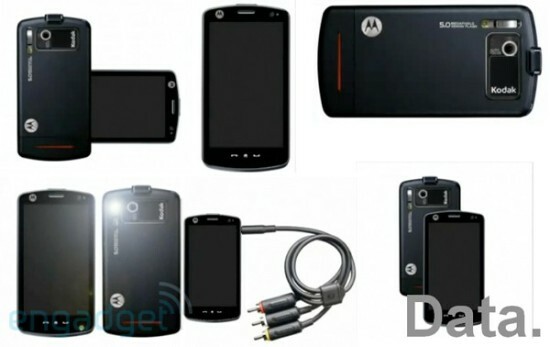 Leaked shots show a large touchscreen device with 5 megapixel autofocus camera, xenon flash and much more. Motorola have been keeping away from the vicious specs race for quite some time now. But some possibly official leaked pictures of a new Motorola phone suggest otherwise. The new Motorola phone has a 5 megapixel Kodak-branded camera with xenon flash, secondary LED flash for taking night video clips plus a large touchscreen display and TV-out support. The OS of this stranger is still a mystery, but we can suppose it's either Android or Windows Mobile. There is not any official word about this phone and honestly, the shots may as well turn out to be fakes. But even if they do, thanks for the nice moment of day dreaming. I am waiting for Moto too! They have gone very quiet over the years, but this phone by looks, is the one! this best be true info coz i want one.